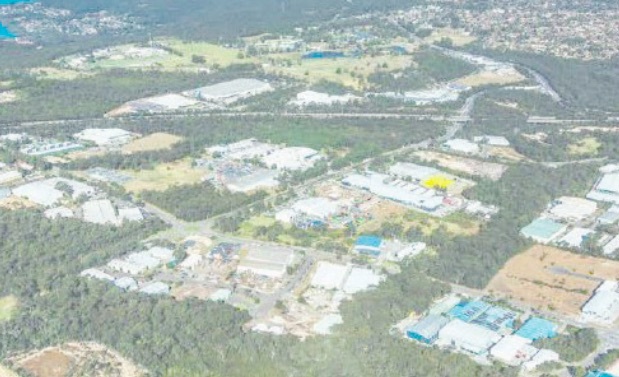 CENTRAL COAST: SOMERSBY TO ERINA GROWTH CORRIDOR TO BE FOCAL POINT | COMMUNITY ACTION ALLIANCE FOR NSW (CAAN): HOUSING INEQUALITY WITH AUSSIES LOCKED OUT! WHAT about a protected Environment? PREDATORS AT WORK … AGAIN! Under the guise of the Office of Strategic Lands perhaps? WHAT is the certainty of the jobs growth numbers due to many occupations being replaced by automation and robotics? IS THIS part of a sinister manouevre to acquire property that suits the political and other Agendas? CAAN refers you to our Website category: Compulsory Acquisition & Land Amalgamation for these articles click the links below, and/or type the Subject Headings into SEARCH! *It is set to protect the area’s history and landscape whist providing certainty for land owners and developers. “Is the remaining land suitable, well-serviced, affordable and developable?” Currently around 50 per cent (159 hectares) of the Somersby precinct is undeveloped and a significant portion of that land is impacted by environmental and archaeological constraints. The draft strategy does acknowledge the area’s rich Aboriginal history. The area is particularly known for its rock art and sites that contain Aboriginal objects and are of Aboriginal heritage significance, and actions are required to protect and enhance them to ensure that their value is preserved for future generations,” it said. *Another action in the strategy is for Council to prepare a brief and engage consultants to consider options for the future use of the Old Sydney Town site, to inform discussions with the landowner. “The new DCP should clearly identify and provide clear guidance for development in areas of high value vegetation and areas of Aboriginal or archaeological significance,” the draft strategy said. Council will also seek funding for, and then commission, a public domain strategy for the Somersby employment area. It also outlines a “catalyst project” in the form of a Somersby Hub, a place to meet and relax during the working day. The strategy could result in 11 per cent of new dwelling requirements on the Central Coast being located along the Corridor between Somersby and Erina. Catalyst projects identified in the strategy include a Somersby to Erina Rapid Transit Bus Route, the Gosford Great Weekender Trail, a food and entertainment festival at Central Coast Mariners home games and Mount Penang Forest Trails. Somersby, Mount Penang/ Kariong, West Gosford, Gosford City Centre, East Gosford/Point Frederick and Erina. 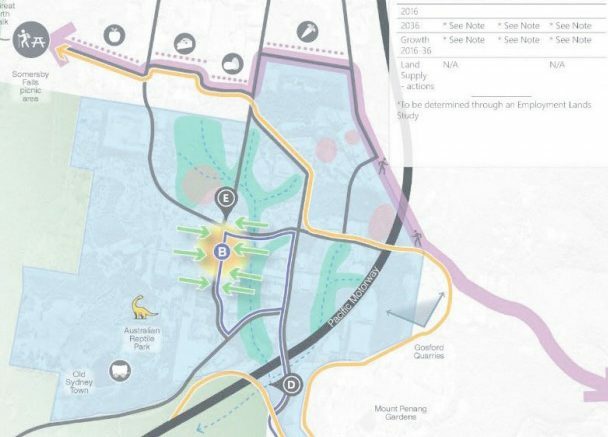 *The preferred development option was one with a focus on Gosford City Centre and the provision of a Rapid Transit Bus system. It seeks to concentrate investment in Gosford City Centre, support job growth and provide adequate land for population growth. The Corridor will be promoted as one of the State’s best weekender destinations. The proposed “Great Weekender Trail” Catalyst Project will help promote weekend tourism, anchored by food and drinks, art and culture, sport and festivals, and events at Mount Penang. “The proposed new Rapid Transit Bus network connecting all centres to Gosford in under 10 minutes, is the priority action for transport in the Corridor. “The Corridor already accommodates a great variety of cultural activities, landscape and natural attractions, and cottage industries. “The Trail could also form the basis for future civic and cultural activities. “The Corridor faces some major risks including bushfires, flooding, inundation from rising water levels, traffic congestion, and lack of public transport connectivity across the Corridor. “Planning for resilience across the Corridor is essential to respond to changes associated with population increases and risks posed by changing weather patterns.” The Corridor Strategy will be used to formulate character statements for each centre in a new comprehensive Development Control Plan.